Early this month, Ogie Alcasid's 19-year-old daughter Leila, through her newly-opened blog, shared that she is moving to Manila, Philippines, from Australia, in 2017. Ogie is supportive of his daughter's big move. "Yes po, she will be living here starting January," he confirmed to members of the entertainment media during the press conference for Your Face Sounds Familiar: Kids. What if his daughter, who has already gained popularity for being international singer Selena Gomez's lookalike, gets an offer to enter show business? "I will not stop her po. I will not stop her if she really wants it." 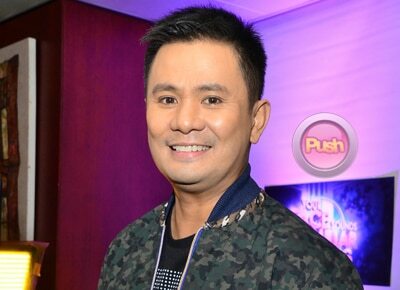 Ogie further shared, "It seems she wants to do some commercial modeling kasi ngayon pa lang, ang dami nang nag-ooffer sa kanya, eh, even just through her Instagram. Parang she's interested to do that. Sabi ko nga kanina, she already started her blog tapos ito pa, nag-aaral na ng Tagalog. Nakikinig siya sa YouTube ng mga Tagalog na mga kanta tapos minememorize niya. Kilala niya 'yung mga artista rito sa Philippines, kinikilala niya and she watches their films to my complete shock." He also said that he got surprised that she wanted to come to the Philippines. "It's a big surprise to me 'nun nalaman ko na she wanted to come home," he said, adding that Leila's mother Michelle Van Eimeren is also very supportive of the move.